Just like the Brush tool, the Pencil tool also supports textures. However, there are important differences between the way brush textures and pencil textures work. For one thing, a pencil line texture is applied with regard to the width and direction of the pencil lines. 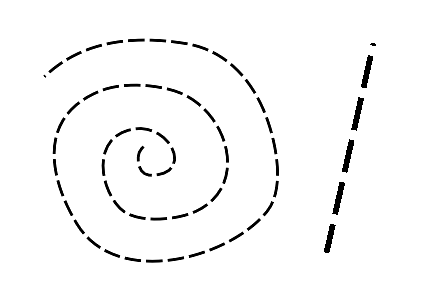 For example, if you draw a spiral with a dash texture, the dashes will follow the curves of the spiral, and if you draw a thicker line with the same texture, the dashes will be both longer and thicker. Like colours, pencil textures are stored in special palettes in your scene. While brush textures are stored in your artwork as bitmap data, pencil textures are stored in your artwork by linking the pencil line with its pencil texture in the palette. This means that if you scale or tweak your pencil line, the pencil texture will be generated again based on the new line's shape and the original texture. This also means that you are able to change the pencil texture of an existing pencil line or to apply a texture to a pencil line that does not already have one. Pencil line textures can also be used with the Line, Rectangle, Ellipse and Polyline tools, as those tools also draw pencil lines.